Are there trends in the types of sociopolitical violence that have characterized social movements after the Arab Spring? How has this violence been represented in the media and in popular culture? What are the legal and political consequences of such representations? These questions fascinated Duke University doctoral students Renée Michelle Ragin (Literature) and Giulia Riccò (Romance Studies). 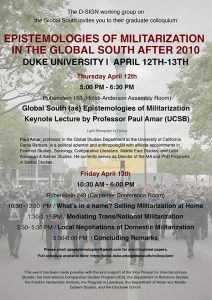 Inviting other graduate students to join them in an interdisciplinary exploration, they created a working group called The Global South after 2010: Epistemologies of Militarization. Guided by their faculty sponsors Deborah Jenson and miriam cooke, Ragin and Riccò received a Duke Support for Interdisciplinary Graduate Networks (D-SIGN) grant for use in 2017-2018. Here are excerpts from their year-end report. We began the activities of our working group with an outreach meeting in September 2017. During this session, we selected the themes for the group’s workshops. 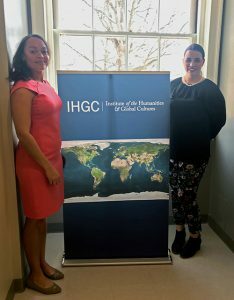 We also began coordinating with the codirectors of the Global South Lab at the Institute of the Humanities and Global Cultures at the University of Virginia (UVA). Our introduction came as a result of our participation in the Academy of Global Humanities’ summer school program, hosted by the University of Bologna and cosponsored by Duke and UVA. 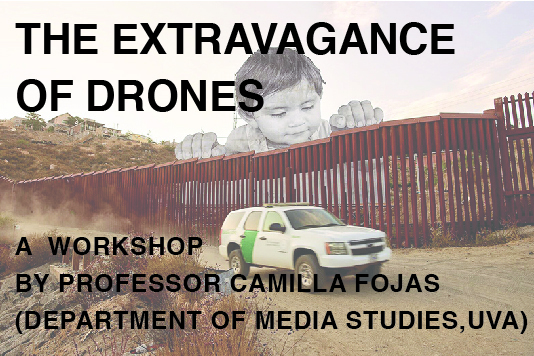 Thanks to our outreach, we secured UVA Professor Camilla Fojas as the presenter and facilitator of our October 2017 workshop on the use of drone surveillance on the US-Mexico border. We realized that having a subject-matter expert assign the reading and moderate the workshop yielded more productive conversations than when we simply structured the workshop around readings we selected. After this event, we took Professor Fojas to dinner, at which time she extended an invitation to come to UVA and organize a workshop on epistemologies of militarization. In November, we began circulating the call for papers for our colloquium and reaching out to possible keynote speakers. We contacted a Duke alumnus, Professor Paul Amar at UC Santa Barbara, who is the director of graduate studies in the Department of Global Studies. He accepted enthusiastically; his areas of study, which encompass both Brazil and the Middle East, speak to our combined interests, and his current research on new forms of militarism and paramilitarism in Brazil aligned with the working group’s mission. The third meeting of the working group took place during the first week of December. We invited two Duke professors, Ranjana Khanna (English, Literature, and Women’s Studies) and Robin Kirk (Human Rights Center and Cultural Anthropology), to speak about refugees and the space of the refugee camp. Their different disciplinary backgrounds allowed us to work toward an interdisciplinary understanding of issues surrounding militarization in the contemporary world. Indeed, as the working group progressed, we realized how important it was to focus on ensuring that our understanding and interpretation of militarization encompassed its myriad forms in the contemporary moment. Through these workshops we were able to identify what militarization looks like today, and where we encounter it. 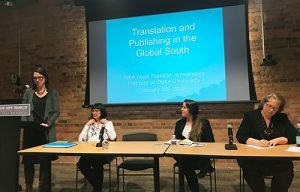 In January 2018, we collaborated with Sylvia Miller, director of the Publishing Humanities Initiative at the Franklin Humanities Institute, to organize a day-long symposium dedicated to publishing and translating in the Global South. This symposium shifted the focus of our working group on to questions of who produces knowledge in and about the Global South. It also offered Duke graduate students working on the Global South the opportunity to find out more about career options available to them as a result of a panel that included representatives of the three major academic presses in the area (UNC Press, Duke University Press, and Oxford University Press). The keynote speaker, Professor Juan Obarrio from John Hopkins University, introduced the new Duke University Press journal series he launched with Professor Achille Mbembe, which is dedicated to highlighting critical thinkers from the Global South. Professor Obarrio is now a contributing author to a special issue of a journal, which we are editing and will be released in summer 2019. Our February 2018 trip to UVA pushed us to reflect on our findings, while giving us a receptive forum in which to test our ideas. We used our talk at UVA as an opportunity to pilot ideas for a cowritten research article, and the positive response we received encourage us to expand our ambitions and find a journal willing to allow us to serve as coeditors for a special issue on contemporary militarization. Also in February, we supported Duke Professor Shai Ginsburg’s conference Emergency Legal Cultures: British Imperial Cultures. The working group was officially listed as a sponsor and we served as the respondents for the two panels. 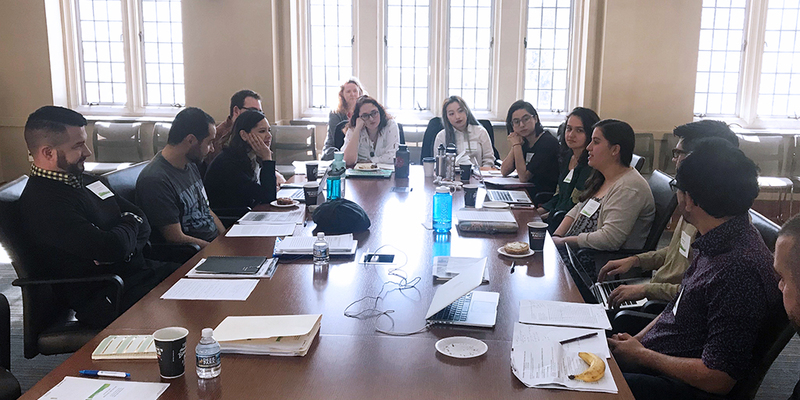 The last workshop took place in March 2018 and featured Professor Shahla Talebi from Arizona State University and her graduate student, Diana Coleman. We discussed the role of the torturers in black sites such as Guantanamo, and read excerpts from Darius Rejali’s Torture and Democracy. On April 12 and 13 we hosted our colloquium. We chose a seminar-style format with precirculated papers in order to give us ample time to discuss participants’ research throughout the day. It was an intellectually stimulating experience and left us with provocative questions that we are addressing in our cowriting. One of the colloquium respondents, Duke Professor Michaeline Crichlow, offered us the opportunity to curate a special issue of Cultural Dynamics: Insurgent Scholarship on Culture, Politics, and Power. The title of the issue is “Epistemologies of Militarization in the Global South,” and is forthcoming in June 2019. It includes two papers from the colloquium, and contributions from several working group collaborators, including Camilla Fojas (UVA), Juan Obarrio (John Hopkins), and Diana Coleman (Arizona State). The article that we are cowriting is going to be the introduction for the issue. This internal funding mechanism from the Office of the Vice Provost for Interdisciplinary Studies encourages graduate students to explore beyond disciplinary lines, both in research and coursework. The goal is to enable graduate students to build or extend their networks and to integrate collaborative, cross-school experiences into their programs, thereby increasing the number of individuals whose graduate training reflects Duke’s commitment to interdisciplinarity and knowledge in the service of society. See who else received D-SIGN grants in 2017-2018. Look ahead to next year’s D-SIGN projects.